(5/23/2015) After we got through the “Death March,” finally it was time for boat diving. We went to the harbor together with a group of Mississippi State geoscience students, got onto the boat sailed by Captain Hogan. After 10 minutes of sailing, we arrived at our first diving site. There was a sunken ship blown up by the U.S. Navy during the battle against Cuba, now it is a wonderful underwater shelter for all the fishes and other kind of creatures. Our second diving site was the drop off; the sea floor suddenly drops from tens to hundreds of feet. Once you passed the wall of shelf, you couldn’t see anything but blue. It was just like the end of the world. We met three friendly sharks there; they seemed causal and mild. Probably it was not meal time yet. 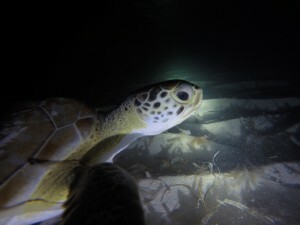 (5/24/2015) Another fantastic experience was night snorkeling. Some ‘night-birds’ only like hanging out at night, such as lobsters and sea turtles. However, their leisurely night life was disturbed by our flashlights. A damselfish was just 10 cm in front of my face, when the light hit him, he turned around and looked at me, like, ‘ What’s going on here? Who is this guy? ‘ Although turtles seem to be loggy on land, you can never touch them under the water. Every time you got close to them, they slipped away like birds. As geologists, we always say, “Present is the key to the past.” The Bahamas is a kind of place you can see both present and past. Comparison and correlation between ancient rocks and modern deposits helped us to understand the processes of sedimentation and also environmental change during geological time. I would say this field trip truly expanded our horizon.